Your donation will help us create and manage a unique historical reconstructed building — thank you. We had a fantastic day recently on Bladon Heath, in the woodlands on Blenheim Estate, carefully selecting the timber for the training courses this weekend, plus marking out timber for the next year’s reconstruction of the House of Wessex. We have chosen a variety of species, 40 trees in total, a mix of ash , sweet chestnut, oak and silver birch. The oak and sweet chestnut are of similar age, around 100yrs and 70 ft in height. The ash are younger at 40 -50 yrs, and again 70ft. The birch are younger at 25yrs and are 50ft. 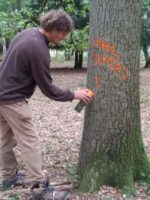 The trees required for the event on 13-14 October (read more) have been felled and delivered to the Wood Centre. 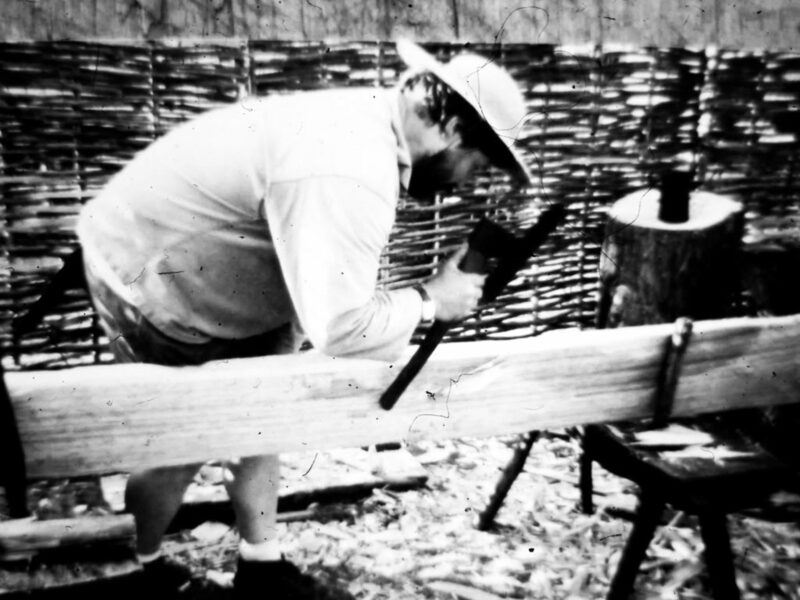 The timber will be used for the formal training course and for the general public to see Anglo-Saxon techniques in action such as hewing, cleaving and making treenails. The work will help prototype some of the techniques to be used in next year’s reconstruction of the House of Wessex. 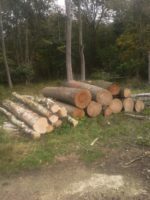 Many thanks to John, Henry, and Joe from Carpenters’ Fellowship for their time selecting the trees, and Nick Baimbridge and his forestry team of Blenheim Estates for felling and preparing the timber. Professor Helena Hamerow, from the School of Archaeology at the University of Oxford, has provided much of the academic expertise for the House of Wessex project. We asked Helena to summarise how the House of Wessex project came about. The idea for the ‘House of Wessex’ project came about as the result of an archaeological excavation by the University of Oxford’s School of Archaeology and Department of Continuing Education on land owned by the Sylva Foundation. The aim of the dig was to establish whether a rectangular cropmark identified in aerial photographs was the footprint of a rare type of building: an Anglo-Saxon hall. The excavations — directed by DPhil student Adam McBride and Dr Jane Harrison in 2016 – were part of a wider investigation led by Professor Helena Hamerow called ‘The Origins of Wessex’. 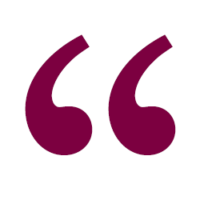 The project aims to gain a better understanding of the emergence in the Upper Thames valley of a leading dynasty referred to by Bede as the Gewisse, who later became known as the West Saxons. Long Wittenham seems to have been a key centre of the Gewisse, as indicated by two richly furnished cemeteries excavated here in the 19th century, and a group of cropmarks indicating the presence of a ‘great hall complex’, of which the excavated building appears to be an outlier. 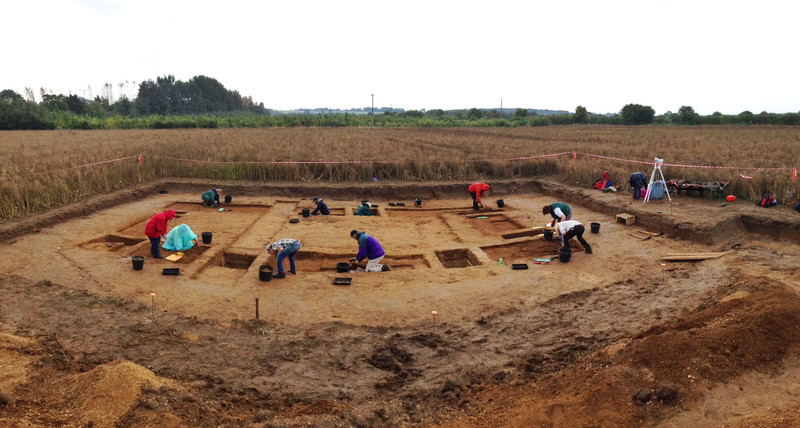 The dig uncovered the foundations of a large timber hall, radiocarbon dated to the seventh century. This period is sometimes known as the ‘Age of Sutton Hoo’ and is the time when the first Anglo-Saxon kingdoms emerged. 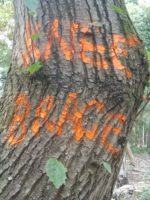 The dig led to conversations about the importance in the Anglo-Saxon world of timber (an Anglo-Saxon word that referred not only to the building material, but also to building itself). This in turn led the Sylva Foundation to pursue the exciting possibility of reconstructing the building in its original setting. The project offers researchers as well as the local community an exceptional opportunity to learn more about the resources needed and methods used — as well as the challenges faced — by those who constructed these extraordinary buildings. 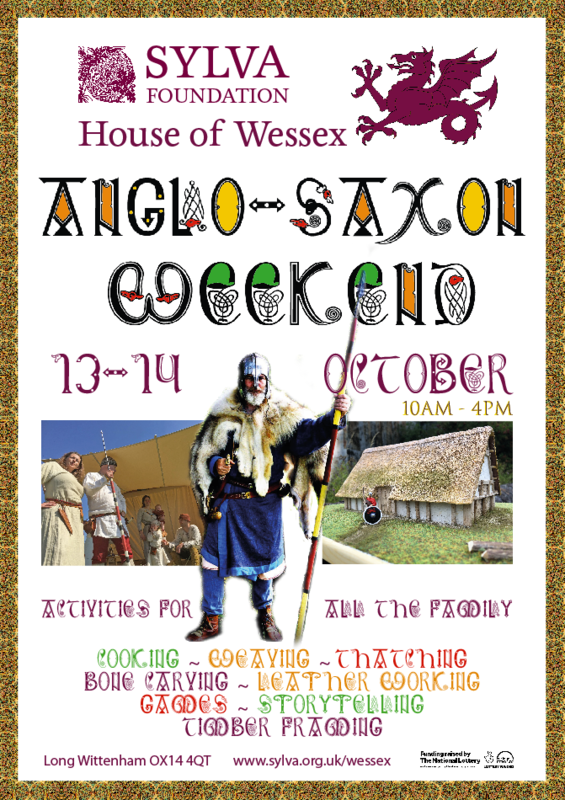 We have a very exciting programme of activities lined up for our first Anglo-Saxon open weekend, as part of our House of Wessex project, funded by the Heritage Lottery Fund. Over the two days we will offer opportunities for all the family to come along and experience a wide range of Anglo-Saxon activities. Watch and learn about Anglo-Saxon treewrighting (not ‘carpentry’!) including cleaving and hewing timbers, and timber framing techniques. Have a go at hurdle making and the opportunity to try your hand at mixing wattle and daub! A thatcher will be holding demonstrations on the thatching techniques to be used for our building. Children can join in milling, from start to finish, to help make bread using a rotary quern-stone. International award-winning living history society, the Wulfheodenas, will be demonstrating a wide range of Anglo-Saxon arts and crafts. There will be textile production, from fleece to fabric, bone carving, antler working, leather working, jewellery and material making and lots more. Children can listen to an Anglo-Saxon storyteller and learn and play games from this fascinating period in history. Each tent will have a mini display and people can see and ask questions about each activity. We look forward to welcoming you and your family. See the event on Facebook. A realistic model of the House of Wessex has been made by volunteer Brian Hempsted. 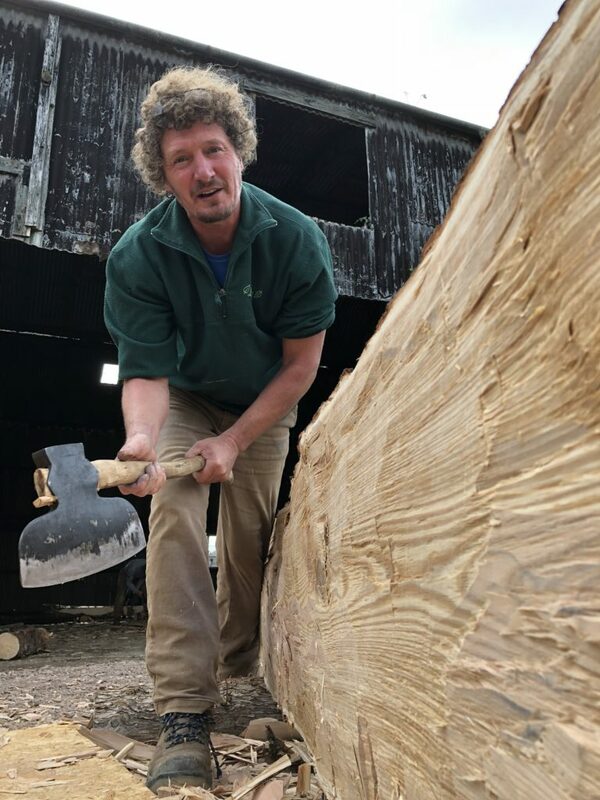 Brian Hempsted has been volunteering with Sylva Foundation for the last year, offering his considerable woodcarving skills in helping resident sculptor Simon Clements complete the Tree Charter poles. When he heard about the House of Wessex project, Brian admitted that he was also a keen model maker and offered to make an accurate model of the proposed building at 1:50 scale. We’ve made a short film showing the model, which he’s just completed. We think it’s just fantastic! The House of Wessex project is funded by the Heritage Lottery Fund. 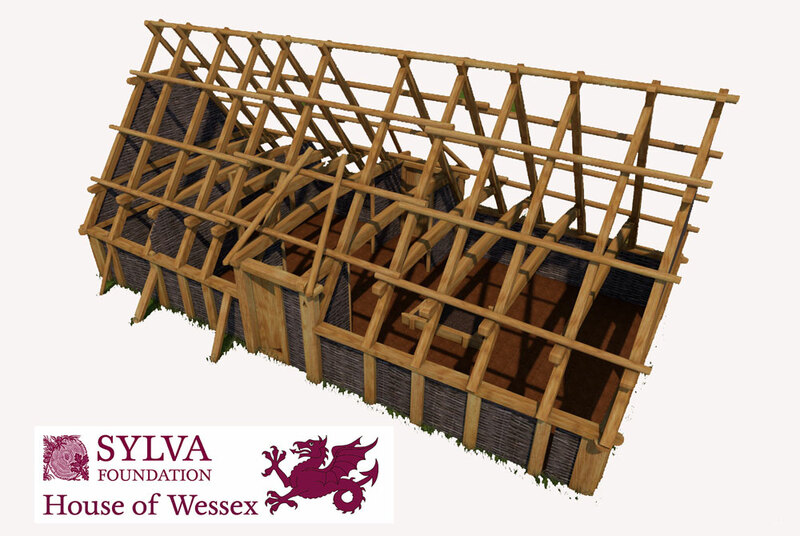 Sylva Foundation seek expressions of interest from timber-framing and archaeological specialists for the design and faithful reconstruction of an Anglo-Saxon house using traditional treewrighting tools and techniques, on the same footprint as an original historical artefact in south Oxfordshire, and to deliver workshops and onsite training.